The risk of slipping has been greatly reduced at this secondary school. 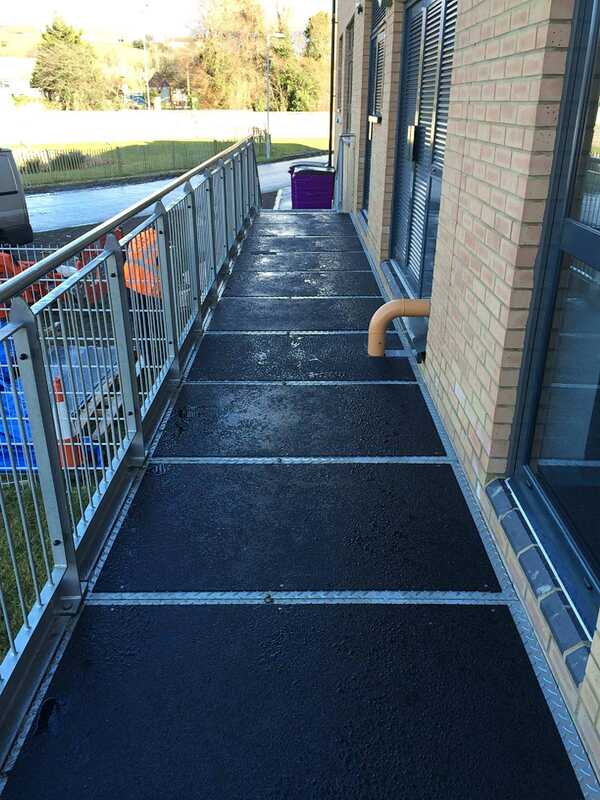 Because of the high footfall and impact applied to the stairwells and walkway areas it became clear that a permanent slip resistant solution was needed. The answer was our anti-slip stair tread covers and flat sheeting simply overlaid on to the existing surfaces. Simple installation and minimal downtime, little or no disruption. Are you a School with Slip Hazard issues? What did this school need? The existing walkways and chequer plated steps were deemed to be unsafe for the foot traffic in these premises. Wet chequer plate contributes to slip accidents and so "Cladding" a superior overlay product from Gripclad offered a long term risk-free solution. For the visually impaired pedestrian all step edges and nosing edges have contrasting colour edge to define the step edge. The School wanted a high wear resistant solution instead of a short term coating method, and that it must provide a good level of slip resistance. GripClad was the obvious choice because they were easy to install over existing stairs, steps and walkways. A retrofit product that offers long term peace of mind and virtually maintenance free was the real answer. Our product is tested with a recorded value of 65 or above for dry conditions. Even when wet conditions have introduced the products still performed to a very high standard. It is highly resistant to wear and tear, high impact and is aesthetically pleasing. The perfect and practical solution on educational premises. So we make them Safe. Gripclad's GRP Pre-formed Anti-slip overlay stair tread covers were easy to install, together with anti-slip sheeting to chequer plated walkways. A straightforward cost effective solution for the long term at these type of premises that see very high footfall traffic.